Yes, the second-ever "Sexiest Man Alive" was a St. Elsewhere cast member. Here's the article from the January 27, 1986 issue of People magazine, "Charmin' Harmon", declaring St. Elsewhere's Mark Harmon, who had just wrapped his run as plastic surgeon and resident eye candy, Dr. Bobby Caldwell, the year's Sexiest Man Alive. The title of "Sexiest Man Alive" had been initiated the year before, as the tag line of a Mel Gibson cover, and since then, the feature has become an annual tradition (with a brief hiatus in the early 90s). Harry Hamlin from L.A. Law would "win" the following year, and after selecting John F. Kennedy, Jr. in 1988, the honour has strictly been bestowed on Hollywood film stars. St. Elsewhere actually holds the distinction of being the only television series to have two main cast members be declared People's SMA, with Denzel Washington, Dr. Philip Chandler himself, earning the distinction ten years later. Not only was Denzel the first black doctor on a TV medical drama, but he was the first black SMA as well. The thing I found interesting about the timing of the article was that it coincided with the demise of his character, who had turned heel during season 4. I guess they admired his dramatic chops, which, as he states in the article, weren't really put to much use in his first two seasons on the show. Mark Harmon's last appearance on St. Elsewhere was in the February 12, 1986 episode, "Family Affair", two weeks after his People cover story, an article which reveals upcoming plot developments in a way that would be considered spoiling these days. You can just hear the show's writers now: "Is this what you had in mind, Harmon, heh-heh-heh?" Well, it was, precisely, even though it meant a hasty exit from the show recently nominated for an Emmy as TV's Outstanding Drama Series. To recap, Dr. Bobby Caldwell contracts HIV, likely from the coked-out psycho who slashed his face (see the second video below), and we learn that he spent his last days in a hospice in California, finally dying at age 36, AIDS having ravaged his body down to 95 pounds by the time of his death. The viewer learns of this in the season 6 episode "Final Cut". In the next episode, "Heaven's Skate", Dr. Wayne Fiscus (Howie Mandel) is chatting with the possibly-HIV-positive and not-well-liked Dr. Seth Griffin when Nurse Helen Rosenthal (Christina Pickles) asks Wayne if he's attending the memorial service for the recently-departed Caldwell that she is organizing. Griffin says, "Caldwell was pretty well-liked, huh?" Wayne replies, "Great surgeon...good sense of humor...some people even thought he was the sexiest man alive." Another classic St. Elsewhere pun. In the May 9, 1987 episode of Saturday Night Live with musical guest Suzanne Vega and host Mark Harmon, the opening monologue features a "Sexiest Man Alive" pageant where Harmon is selected the winner over runner-up F. Murray Abraham (Jon Lovitz). Found some great Bobby Caldwell features on YouTube! Get a sense of Dr. Bobby Caldwell if you don't remember or never saw it. 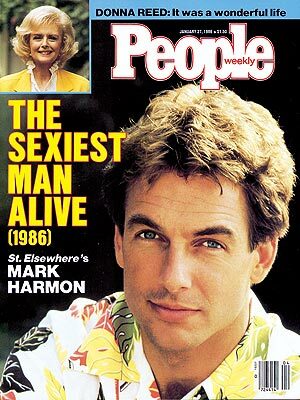 Here's "The Best of Mark Harmon in St. Elsewhere", featuring his storyline with the burned firefighters, plus a taste of his ongoing conflicts with Ehrlich in the O.R. A great point in Bobby's fourth season dark turn. Bob's trip to his house in the cape takes a turn for the worse when he picks up the wrong girl. Jump to 5:37 for the money scene. Shout out to the use of a soundalike of the Alan Parsons Project's "Eye in the Sky".